Thanksgiving is a time for friends and families to come together and reflect on what they’re thankful for. I’m known for bring the outside in for my tables – I like lots of fresh greenery from the trees around our place, including anything with berries on it, and lots of cedar boughs! 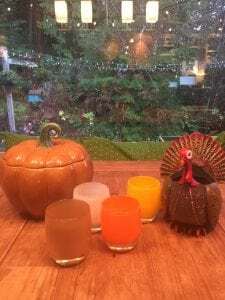 We also raise turkeys on our farm most years, so turkey-themed decorations play a prominent role (turkey name cards, turkey figurines and more!). Lots of fall colors and candles are a must, but my Mom’s famous stuffing, lots of cranberry sauce and mashed potatoes are the best tabletop decorations, along with the turkey! Happy Thanksgiving. We have so much to be grateful for!!! My Thanksgiving decorations are minimal, as I spend most of my time cooking. 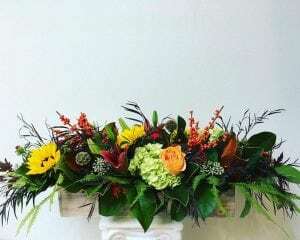 I will be purchasing a fresh flower arrangement from “Down To Earth” flowers and gifts, which I plan to surround with some small glass turkey candle holders I own. My favorite decorations, of course, are the wonderful family members sitting around my table. 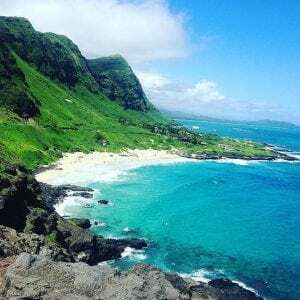 Our Senior Media Specialist Melissa will be saying mahalo this Thanksgiving! We’ll be thinking of Melissa during our chilly Thanksgiving Day! My family tends to be fairly minimalist when it comes to table decorations for Thanksgiving (it’s all about the food! 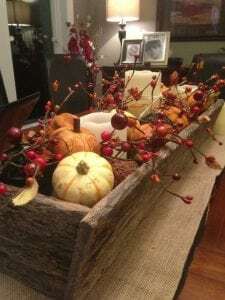 ), but last year, my aunt and uncle were in the process of remodeling their house on Thanksgiving and used some of the extra wood lying around to make a long planter, which we used as a centerpiece. We filled it with some gourds and other plants and interspersed candles throughout, which made for a very festive table decoration! The best part is we’ve been able to reuse the planter and fill it with different materials for other holidays – pine boughs or poinsettias for Christmas, flowers or dyed eggs for Easter, etc! In terms of decorating for Thanksgiving, my family has always liked to keep things simple. The food is definitely the most important aspect of the holiday and usually takes up most of the room on the table. That said, I do like to make sure the table has a festive look to it. We don’t decorate our table the same way every year, which makes coming up with a new and creative ideas every year fun! 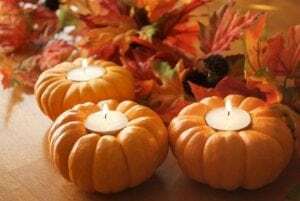 This year, inspired by Pinterest, I am planning to buy a few miniature pumpkins from Trader Joe’s and put candles inside of them as the centerpiece. When my family doesn’t travel to Texas for Thanksgiving, we celebrate at home with our family in Seattle. The kitchen quickly becomes my mother’s domain and I’m tasked with setting up the tables and decorating the house. 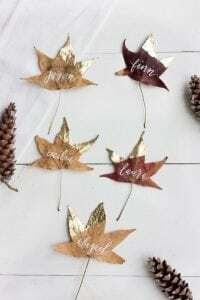 Every year the decorations are a little different – from candles to wreaths – but this year I’m most excited to make a falling leaf garland for our mantel. All you need is leaves, glue, a paint brush, glitter, a hole punch and ribbon. First, you paint the glue onto the leaf then sprinkle glitter on the surface. Once the leaf is dry, shake off the excess glitter, punch a hole at the top of each leaf, and attach a ribbon that you will then tie to a longer ribbon strand to create the garland. Since I’ll already have the materials, I’m going to keep with the foliage theme and make name place cards by decorating only a corner of the leaf in glitter and writing everyone’s name in gold sharpie. l for this year. For this decoration you can use cardstock paper as a place mat (typically 12’’ tall by 18’’ long) in color that works with your color scheme. This simple concept can also be incorporated into the napkin and plate arrangement. 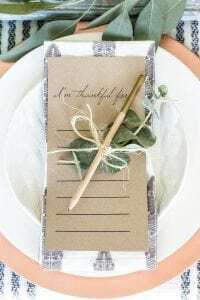 It will be important to remember to provide guests with a pen or pencil and that you choose a paper color that allows the writing to appear. Now when everyone gathers around the table they’ll be prepared to share what they’re thankful for this year! Whether you’re surrounded by Fall foliage or palm trees, we hope everyone enjoys a restful Thanksgiving full of friends, family, gratitude and, of course, some good eats. From all of us at The Keller Group, Happy Thanksgiving!